And get some wings at J Bell's afterwards. Good stuff. UPDATE: The pool will be opening on May 29, 2010 for weekend operation only (12pm – 6pm, Sat & Sun). It will switch to a daily schedule on June 21, 2010 (Mon, Tue, Wed, Fri, 1pm -8pm; Sat & Sun, 12pm – 6pm; Closed on Thursday). The City Paper has a long piece on the meeting about Morgan's Seafood's application for a liquor license, which according to Romeo Morgan (who the City Paper described accurately as a "charismatic Rastafarian") has been pending for more than 200 days. Basically, they moved the meeting to Morgan's to try to make it more informal and less heated. There was still some arguments, but it seems like they're at least trying to compromise. Some neighbors supported Morgan, while some were opposed to more booze in the area, then an older resident was the voice of reason. One thing I disagree with is the author's suggestion that Morgan was the cause for ANC chair Cliff Valenti to resign -- I think that was more differences with other ANC commissioners, like when Lenwood Johnson and Valenti had a falling out over Johnson wearing a Fenty sticker to a meeting, and then all hell broke loose. 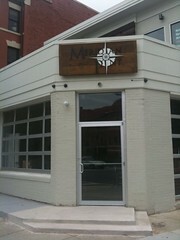 A friend just emailed me this photo of the Meridian Pint sign, which is now up. The friend also said they've finished hiring their staff, a sure sign they're almost ready. Their Twitter says "only a few weeks away now," and they said before it will be early June. Here's more on the spot, including menus. 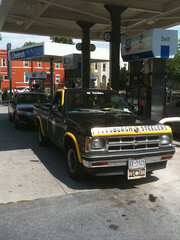 Spotted this at the Chevron on Sherman Avenue, a big-time Steelers fan decorated his pickup truck. It's even got DC plates. Kind of surprising we don't see more Redskins cars and trucks like this in the neighborhood. Well, it was fun while it lasted. A couple of weeks ago I saw a plan for a streetcar on Georgia Avenue, and now today, the DC Council took out funding for the streetcars. There has already been money spent and some tracks laid. Now it looks like the earliest we'd see any streetcars on our streets would be 2014, and that would probably be the H Street NE line, which means many moons until we can hop on the Georgia Ave line, if at all. It looks like council chair and mayoral candidate Vince Gray was the lead in taking out the funds, and I've since emailed him expressing my displeasure. If you want to do the same (or, conversely, congratulate him) his chief of staff's email is DSlonneger@dccouncil.us. UPDATE Looks like after a bunch of angry people got in touch with Gray and the rest of the Council, they somehow found the money and restored funding. Good to hear, though the quick flip flop doesn't inspire much confidence. Spotted this in the Examiner, pretty odd story: there was a fender bender in the neighborhood between an off-duty detective and a guy in a $120,000 Porsche. There were some profanities and gestures after the crash, both blamed each other. The detective called the police, the Porsche guy was arrested and jailed for 14 hours for reckless driving, but was later found not guilty. He sued, and the detective, who described herself as having a high "level of pissitivity," was found to be liable to pay $450,000 to the Porsche driver. Weird stuff. And that was before all the road construction! Just saw this on the listserve, ANC1A is hosting a meeting on the cooperative agreement for Morgan's Seafood at the corner of Georgia and Kenyon. A cooperative agreement is where the ANC and a business agree on what terms to sell liquor, like hours, days, what to sell, and so forth. Morgan's Seafood is applying for a liquor license, but first the ANC has to ok it. I was just at Morgan's on Sunday, and the owner Romeo, who is a real character, made some fantastic steamed crabs. It's not the most picturesque spot, but they do have some good stuff. I've heard he has been hit hard by seafood prices after the Gulf of Mexico oil spill. The meeting is tonight at 7 pm at the Emergence Community Arts Collective, 733 Euclid Street NW. Morgan's Seafood. 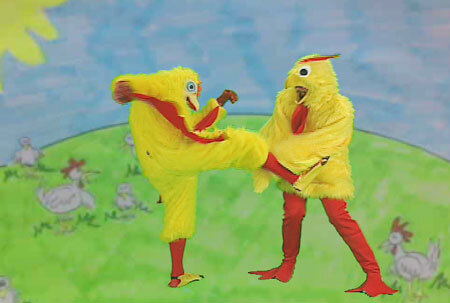 Welcome to Part 1 of our series on pollo places in the Columbia Heights/Mt. Pleasant area. The concept of this series is pretty simple: we eat at all the Peruvian chicken places in the area with a bunch of friends. 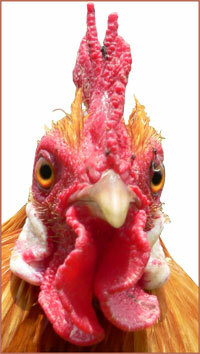 Each diner rates the place on a 5-Cluck scale in four categories - Chicken, Side Selection, Side Flavor and Atmosphere. On the list to visit are Pollomio (3703 14th St NW), Senor Chicken (3100 14th St NW), Pollo Sabroso (1434 Park Rd NW), and maybe the Pollo Sabroso in Mt. Pleasant (3153 Mt. Pleasant St NW). If you know of any additional pollo places that we should try, please let us know in the comments. The diners were split on the chicken depending on whether they got the light meat or the dark meat. They commented that it was tender, succulent, moist and easy to eat, but also noted that the seasoning is somewhat overwhelmingly salty and that the dark meat tended to be too moist and fall apart. While we were there, they ran out of yucca (at 6pm). In subsequent visits they've been running low on or have run out of some sides. Along with the beans, rice, fries, corn and yuca that we ordered, they also offer mashed potatos (which they were out of), cole slaw and fried rice. So there was a broad selection, but it's not necessarily well stocked. Two of the diners commented that they really liked the plantains. The rice and beans were deemed "pretty good," but the beans were red beans rather than black beans. The diners really liked the green sauce and the (free) rice pudding. The diners were split on the question of atmosphere. Pollomio has two floors and an outdoor patio. 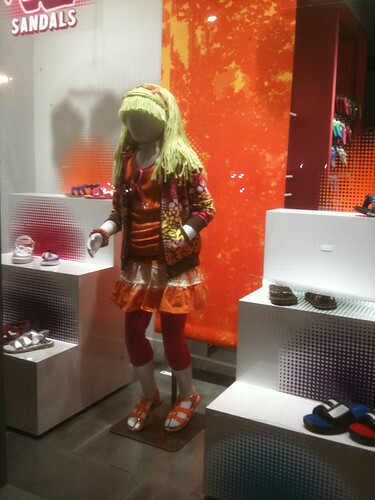 The entire front wall is a window and the place is primarily decorated in orange. It looks a bit like a stylish cafeteria. Everyone was enthusiastic about the outdoor seating and the service was extremely friendly. They also have free wifi, which is very convenient if you like to get stuff done while eating your pollo. One atmospheric aspect that was a big detractor for everyone was the music selection. The Pollomio folks were jamming out to Creed and contemporary Christian rock. Here's some morning amusing stuff for you: saw this display the other night at Children's Place, the kids store in DCUSA, kind of bizarre. The boy clothes kind of look like something a weird uncle would wear, but with Corey Worthington shades, while the girl looks like Rayanne from My So Called Life. 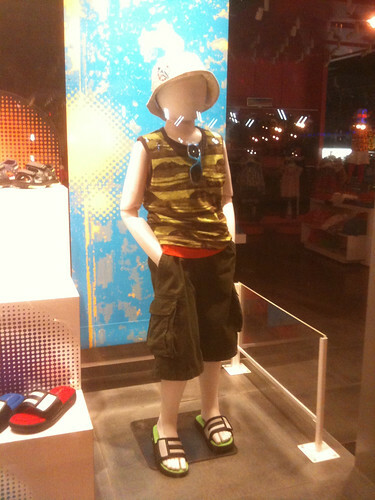 But who knows, maybe I'm not up on what's cool for kids these days. Howard U to move its hospital? Saw this on the City Paper, it looks like Howard University is considering moving their hospital, which is currently located just southeast of the university's campus, about 5th and V. They're looking at Walter Reed Army Medical Center, which will be closing, as a place to go. I think it'd be nice for Walter Reed to have a hospital tenant, but at the same time, people are worried because the closest hospital to Columbia Heights and environs would be moving. The next closest is the big Washington Hospital Center campus at about 1st and Irving. I've never used Howard U hospital, so it probably won't affect me (knock on wood) but who do others think? It would also mean a number of jobs would move from the neighborhood, though Howard says they'll keep some health functions at the hospital. It's looking like a nice weekend, so get out and take a walk! 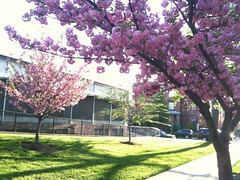 This weekend is WalkingTownDC, which offers over a hundred guided walking and bike tours for free. The Columbia Heights Heritage Trail tour is on Sunday from 1 to 3 -- I took the tour with a guide a couple of months ago and it was fascinating -- lots of interesting things to learn about the neighborhood -- the Marriott company was started in the neighborhood, there was a horse racing track on Holmead Place, the Tivoli Theater showed the first talking movies in DC, and more. There are a lot more tours too, including one around Howard University. 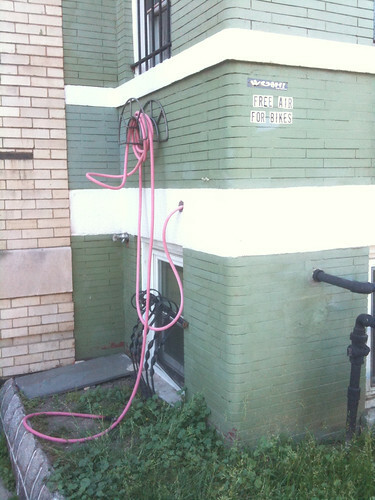 Saw this the other day, and it works well today for Bike to Work Day: a house on 13th just north of Irving is offering free air for bikes. Pretty cool! ♥ "Performing Arts Place" (1316 Kenyon Street NW) -- highlighting select scenes by our friends at Third Beat improv; routines by comedians Mike Blejer, Reggie Melbrough, and Mike Curran; a vocal performance by the a capella group SongRise; an acoustic set by singer/songwriter Spencer Thanhouser; and many, many more performance artists to be confirmed. ♥ "Casa de Canvas" (3209 13th Street NW) -- featuring work by artist Jennifer Droblyen; portaiture by painter Jennryn Wetzler; mixed-media pieces by artist Claire Briggs; charcoal sketches by artist Xi Chen; plus a special exhibition of oil paintings on loan from the private Kormendi Collection, curated exclusively for the Columbia Heights Salon Series by CHARTS founder Josef Palermo. ♥ "Digital Media Den" (3016 13th Street NW) -- showcasing work by local photographers Ben Droz, Deena Delfosse, and Shara Riesz; short films by visual artist Casey Girard; and much more. ♥ "Installation Station" (3209 13th Street NW, basement) -- occupied by mixed-media sculpture from artist Serinity Knight and constructed pieces by installation artist Evan Howell. - a special closing show featuring local folk-rock phenom Phillips Saylor. 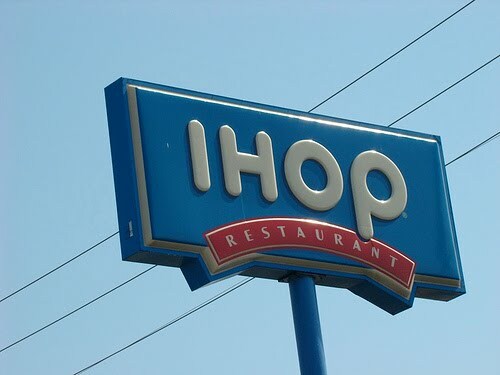 Poll: Are you excited about IHOP? I've noticed there has been a lot of strong opinions on IHOP coming to the neighborhood, on both the pro and con sides, so I decided to have a poll. Please vote, and post why you voted that way in the comments. 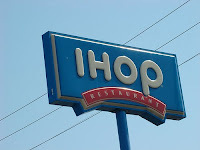 PollPub.com Vote What do you think about IHOP coming to the neighborhood? This Friday, May 21, is DC's Bike to Work Day, and the organizers have put together an afternoon rally, called Bike From Work, in the Civic Plaza. Going from 4 to 7 pm, there will be free food from Giant, giveaways, limited tune-ups from City Bikes, and more. They've also invited the mayor, councilmember Jim Graham, bicycle police officers, and more. Sounds pretty cool. BloomBars, the cool non-profit art space at 11th and Kenyon next to Wonderland, always has lots of neat events going on, often too many for me to post. To keep up on the happenings there, check out their Twitter: @bloombars. Good stuff coming up! 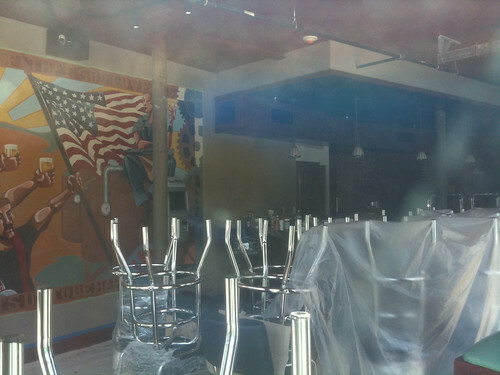 Snapped this shot through the window at Meridian Pint, it looks almost completely done inside, with a mural on the wall, chairs stacked on tables, and the bar is finished. The place will have a lot of American craft beer in the $4 (PBR, Duck Rabbit) to $9 (DuganA, not familiar with that), plus American/European influenced food, with entrees like catfish, ribs, pork chops, polenta from $15 to $18 and sandwiches from $10 to $12, plus lots of appetizers/bar food. The menus for both on their website. There will also be TVs. They'll be open before the World Cup (which starts June 11), and it sounds like a cool spot to watch a game and hang out. I'm hoping it'll be like the Black Squirrel in Adams Morgan -- sort of a neighborhood, relaxed sports bar. Get knowledgeable on your neighborhood! The joint South Columbia Heights Neighborhood Association/ Metropolitan Police Department's PSA 304 /ANC 1B03 meeting is tonight at the Josephine Butler Parks Center, 2437 15th St NW, starting at 7 pm. Alcoholic Beverage Regulation Administration Director Fred Moosally is the guest speaker. ABRA decides who gets liquor licenses in the city. Yet another local farmers market has started up, this one at Howard University during the week. The market, featuring local farmers, runs every Tuesday from 3 p.m. to 7 p.m. and every Friday from 10 a.m. to 2 p.m. in the hospital courtyard, which is near Georgia and V Street NW. The university started the market in order to help local residents get fresh and healthy foods, which aren't always the easiest to find. Dr. Denia Tapscott, a bariatrician and program director for the Center for Wellness and Weight Loss Surgery, said the Farmer's Market will provide a valuable service. "As you know, obesity is a huge issue for the nation, and particularly for African Americans," said Tapscott, whose center is being featured over the next twelve months in EBONY magazine. "One of the contributing factors to obesity is lack of good nutrients." "Much of the food we eat doesn't have the amount of vitamins we need to make us metabolically healthy, and that particularly happens when you don't get the vitamins and nutrients from vegetables." "Additionally, when we don?t get the fiber in our diets, we tend to be more hungry. When you eat more fruits and vegetables, particularly vegetables because of the fiber, we feel more satiated. Your calories are less and you are getting better nutrients. That contributes to weight loss." 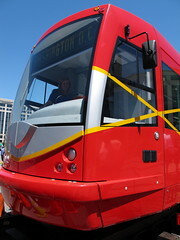 Just saw this over at the Parkview DC blog, the city has proposed a streetcar on Georgia Avenue as part of the city-wide streetcar plan. It would run from the U Street Metro to the Petworth Metro with only a few stops in between. Might be a neat alternative to the bus or Metro, though it's more useful in that it would tie into the rest of the system. The MuralsDC program, which offers murals to commercial property owners free of charge to cover graffiti, is in its third year. The program involves local youth, who do the painting and learn about art, and the ideas for the murals are chosen through discussions with property owners and neighbors. Local artists help design and supervise. It's a pretty neat program, and if you're interested in it or want to learn more, check out their website. A number of the murals are in our neighborhood, including one at Georgia and Fairmont and another in the 3900 block of 14th Street NW. The program has been featured in the Post and BBC News. 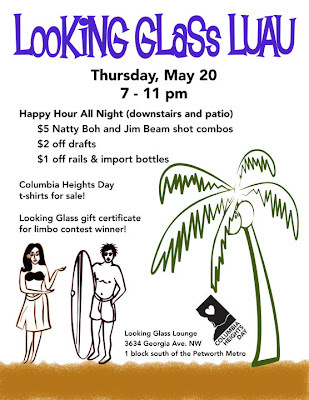 Looking Glass Lounge is hosting a luau to benefit Columbia Heights Day, and it sounds pretty fun: a limbo contest for gift certificates, and all-night happy hour with $5 Beam and Boh combo, $2 off drafts and $1 off rails and bottles. 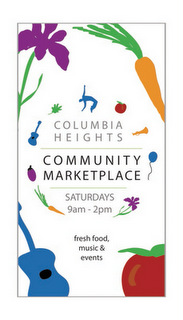 Plus they'll bee selling Columbia Heights Day t-shirt, and I'm assured they won't say "CoHi" on them. The organizers are looking for volunteers too. Spotted this in the neighborhood, I think near Wonderland. Kind of a foggy memory. Anyway, a funny way to start the morning. Maybe he's interested in IHOP? 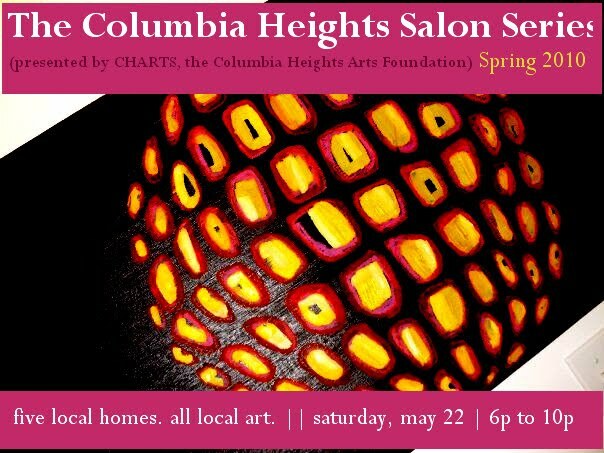 If you feel like getting a good meal and helping out the upcoming Columbia Heights Community Marketplace, head to The Heights on Tuesday for dinner. 10% of all proceeds that night go to the market, covering overhead costs and also "empowering local youth who will work at the Marketplace to gain entrepreneurial skills and learn where fresh food comes from and how it is produced." Sounds good. The Community Marketplace, which includes a farmers market plus crafts and services, opens June 5 and runs every Saturday from 9 am to 2 pm at the CH Civic Plaza (14th/Park/Kenyon). Finally some real news on the IHOP front -- the City Paper reports it will be opening in August on the 1400 block of Irving, and will bring 110 jobs. Sounds good to me -- though I'm always worried about too many chains coming to the neighborhood. Here's IHOP's website and menu in case you forgot. This will be the first second location in the city. Don't know the hours yet, but I would think they'd be open late. I would also guess they'll be in the DCUSA building, hopefully not taking the space that was supposed to be Ellwood Thompson's grocery store. The comments on the City Paper post are kind of funny, too. 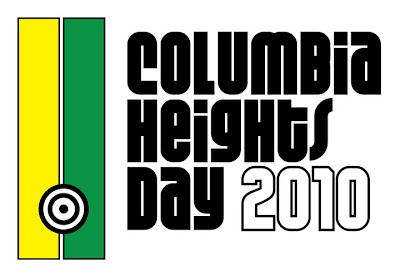 Spotted this on Facebook, the new Columbia Heights Day logo has been released. I like it, showing the Metro station and a funky font. The logo was selected by the committee from a number of designs submitted by the public, which is a different process from last year, where there was one designer. Last year's design (CoHi Day) had some detractors, me included. Your thoughts? 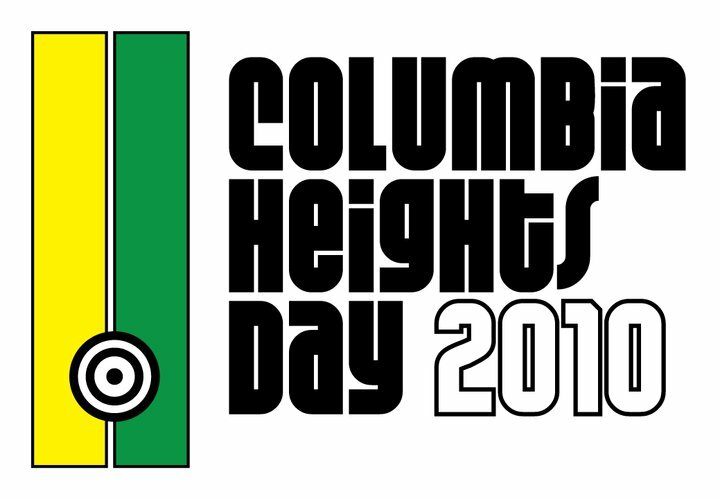 Columbia Heights Day is August 28, 2010. Craziness in ANC1A! Commissioner bicker-fest! That message was posted not by Valenti, but forwarded to the listserve by commissioner Lenwood Johnson, to which commissioner Betty Pair objected, in an email not sent to the list: "It seems to me that Cliff should have been allowed to make his own announcement about what he is or is not doing on the commission.. .and not to have been pre-empted by Lenwood Johnson." I simply forwarded Cliff's resignation note to the public. I would think any sensible person would find nothing wrong with my action. However, I'm not surprised by your response." After your illegal behavior last night, Im not surprised by your response." I'm sorry that I parked too close to a fire hydrant Wednesday night. (Luckily, I didn't get a ticket.)" Moore: "Hatch Act, I wish you gave a damn." Johnson: "...And I wish you would take the time to find understand the Hatch Act, which is applicable only to government employees. I am not a government employee; I am an elected government official." Moore: "Well, since it's a D.C. electeded position, the Federal Hatch Act does apply." Johnson: "am neither a federal nor local government employee, so the Hatch Act does not apply to me. I"
Then another resident acts as the voice of reason, and the bickering stops: "I hope you all realize that you are sending out your childish banter to the entire listserv. It's neither appropriate for this forum or becoming of adults. Please keep it to yourselves." I'm not sure what the purported "illegal behavior" was. Over on the Columbia Heights Yahoo group, a resident posted an email where Valenti explains his resignation, saying that rules weren't followed at the meetings, commissioners were using money without reporting why (like paying cell phone bills), aren't following up on grants to see if they're spent properly, and actually advocates that ANCs be dissolved. Interesting stuff. UPDATE: Commenters say Johnson was wearing a Fenty sticker. I'm not sure if that does violate the Hatch Act, which prevents federal and DC employees from political campaigning, but which doesn't cover the DC mayor and city council. However, I'm not sure if ANC commissioners are counted as DC employees -- I would think not, but the issue is somewhat unclear, though as of 2009, the special counsel ruled that it does cover ANC commissioners, meaning Johnson was wrong. However, wearing a political sticker may also violate ANC rules. Not sure. UPDATE 2: These two got into it before as well, using the same forward-to-listserve method of escalating the argument. There's a Meridian Hill neighborhood? There's a neighborhood called Meridian Hill? Via the City Paper's Housing Complex blog, I found this article on DCMud, a real estate blog, about a new affordable condo building at 14th and Chapin. It sounds like a nice project, and is replacing a vacant lot (seen here). However, here's the part that caught my eye: "The project joins two other planned developments, Nehemiah Center and 14 W (the latter two sitting idle, for now), in the Meridian Hill neighborhood, equidistant from the Columbia Heights and U Street Metro stations." The Meridian Hill neighborhood? That's the first I've heard of this. It sort of makes sense, as Columbia Heights is a big area, but then again, that's also just as easily called south Columbia Heights. For example, the South Columbia Heights Neighborhood Association meets a block to the west on 15th Street, across the street from Meridian Hill Park. There is a Meridian Hill Neighborhood Association, though I don't really hear about them much. Plus Columbia Heights was named for Columbian College, which was located on Meridian Hill. What do you think? 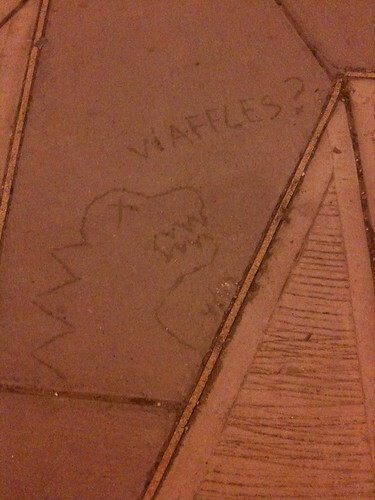 Part of Columbia Heights, or its own thing? Do people who live in that area say they live in Meridian Hill? A commenter on a related Greater Greater Washignton post says they do, but I've never heard it. 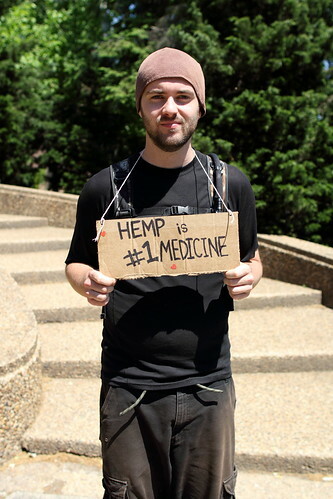 I wrote about the marijuana march ending at Meridian Hill Park last weekend, and Mr. T in DC took a few shots of it, check them out. Looks like it wasn't too big, though maybe the crowds were at another time. The city's recently passed a medical marijuana bill. I'm going to start a new series on the blog about small streets that people may not be familiar with in the neighborhood, which I'm calling Forgotten Streets. The first episode is on Pine Street. The street is very short, about 1/4 of a regular-sized block, and basically exists as a way to turn left from 16th Street onto Park Road, which hits it at an odd angle. There's a turn lane from 16th that turns into Pine. 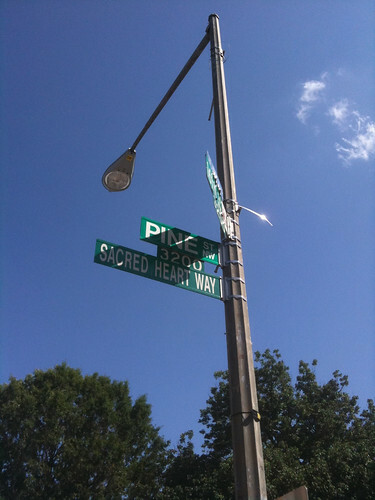 The only building on it is the Shrine of the Sacred Heart church, a Catholic church, which is why there's an honorary "Sacred Heart Way" sign under the Pine Street sign. Not sure why it exists, really, as it's at an odd angle that doesn't match any other streets. Here's the current map on Google, and you can see it on this old map from rockcreek's Flickr as well. 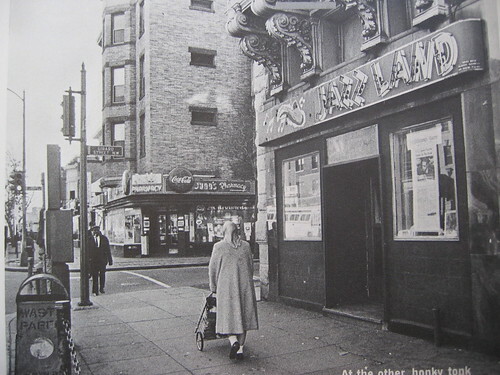 Spotted this cool old photo from rockcreek's Flickr page, it's a shot from about 1964 of the northwest corner of 14th and Girard, featuring a jazz club (I assume) called Jazz Land, plus a pharmacy across the street. The photo's notes say that the building with the pharmacy was looted and burned during the 1968 riots. The corner with Jazz Land (assuming I have the right one) is now where a three story apartment building is, and the other corner is the Lofts of Columbia Heights, which always seems kind of empty, and is also home to the Dunkin Donuts. Here's the current view from Google Streetview. 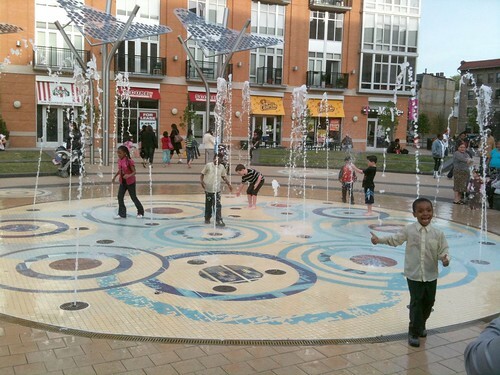 Looks like the fountain in the Columbia Heights Civic Plaza (14th/Park/Kenyon), which has been rather weak lately, will be back to its full vigor soon, seen above. A constituent sent an email about the low flow to Jim Graham, who then passed it on to DPR and DDOT, who said it was fixed Tuesday. I haven't been by, but let's hope so. Apparently the issue was dust and other crud from the street construction getting into the fountain's works. Update on Meridian Pint: almost done! Just got a tip from a reader about Meridian Pint, the new bar and restaurant coming to 11th and Park. He says "the renovations are moving along nicely on the interior; it looks nearly complete," and they're finishing up some murals on the interior walls. The food and drink menus are also up on their website, (under "Food" and "Drink") which is nice to see. It looks like they're about the same as CommonWealth, price-wise. PoP said a couple of weeks ago that they're opening in a month, and definitely before the World Cup begins, which is June 11. That's on track from what owner Joe Andrade told me a couple months ago, and Andrade mentioned then that he wanted to show World Cup games, which I fully support! Do you know whats up? all buses emptied for 6 blocks, cops searched our bus, and firemen on the roof of target. bomb scare? 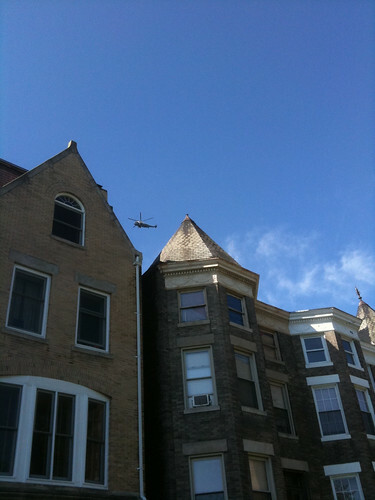 Last week, on the morning of the 6th, I noticed that the Presidential helicopter was circling the neighborhood. The helicopter itself is not unusual to see, but to see it circling was -- it was a good 15 minutes, from about Irving to Fairmont. Maybe Obama was checking out the area? Or maybe the chopper was just waiting to land and the president wasn't in it -- his schedule doesn't mention any trips. In any case, thought it was interesting. Garbage, drug dealing at Duron Paints? Looks like the Duron Paints store at 14th and Clifton isn't just an odd outlier in the neighborhood, there may be more going on. One resident posted on the neighborhood listserve about a bunch of garbage dumped there, like a mattress, trash bags, rats, and more, and another thinks drugs are being dealt there, indicated by a lot of cars pulling up, stopping for a minute to talk to somebody, and driving away. It looks like ANC commish and South Columbia Heights Neighborhood Association president Sedrick Muhammad forwarded the complaint on to the city. I would recommend that if people think drugs are being dealt there, they call 911 to report it. The more reports the area gets, the more attention it will get. Anybody else notice anything fishy at the store? A good sign for residential development in the neighborhood? The City Paper reports that every unit but one in Kenyon Square has been sold. The last one is a two-bed, two-bath priced at $549,000. That's a lot of dough. If you'd like to know what's happening and what could happen to Georgia Avenue, check out the Georgia Avenue Community Development Task Force meeting tonight, from 7 to 9 pm at the ECAC, 733 Euclid Street NW. The GACDTF (quite an acronym!) has done a survey on the avenue as well. 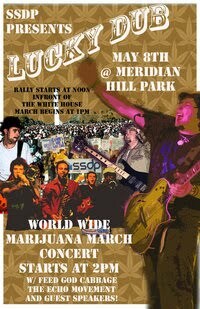 Got a Facebook invite the other day for a Students for a Sensible Drug Policy march on Saturday, which ends with a concert in Meridian Hill Park. 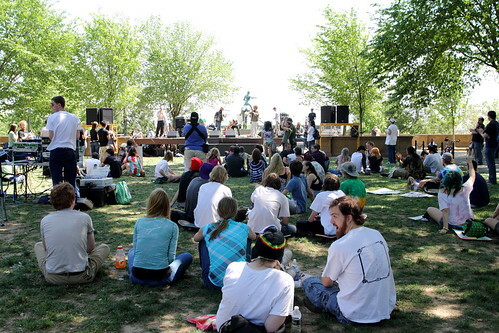 The march, which begins at the White House at noon, ends up at the park around 2, and the concert starts at 2. the last band, former Band in the Neighborhood Lucky Dub, goes on at 7. Now here come the jokes about the park already being a marijuana rally. Looks like the east Park Road and Irving Street sidewalks are done, and they're looking pretty nice. Some benches, some trees, some mulch. One thing, you better look where you're walking or you might fall over a bench. Otherwise, the Columbia Heights Streetscape is continuing apace. Here's what's happening today and soon. That was fast! 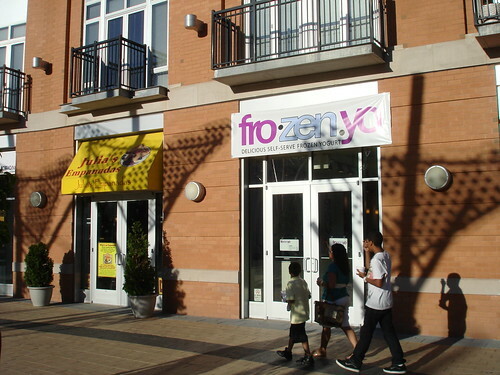 Not long after seeing Rita's closed, Fro Zen Yo opened in the space. 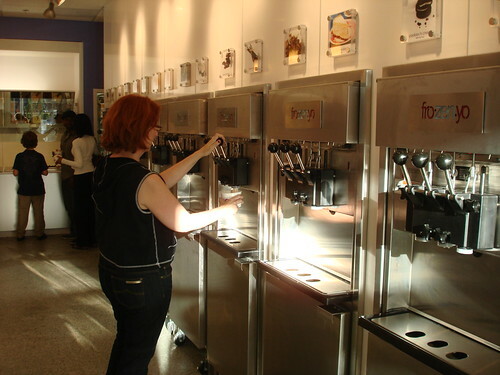 It's a self-serve yogurt shop, meaning you grab a bowl then choose which flavors you want from the dispensers and give yourself however much you want. Then you can add toppings, and the whole thing is weighed at 39 cents an ounce. There were about 15 flavors and I tried red velvet cake, which was great, and Cali tart, which was not very tart but still tasty. 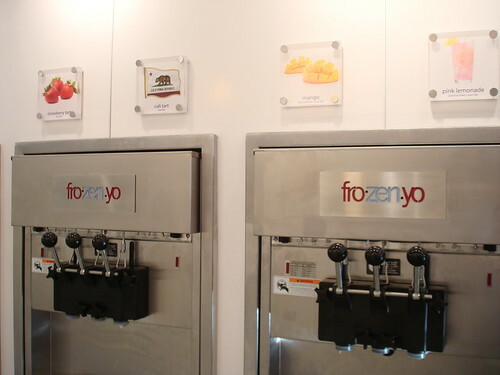 Other flavors included mango, peanut butter, cheesecake, and birthday cake. The toppings are what you'd expect from a frozen yogurt place: fruit, nuts, cereal, and candy. I added Cinnamon Toast Crunch and some strawberries, and the whole was not quite $2. 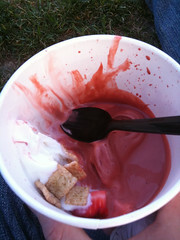 I got a picture of the yogurt (above), but I was busy scarfing it down so I didn't get a pre-eating shot. I also took some photos of the space and the dispensers, which look like soft serve dispensers, but unfortunately I couldn't get them to download for some reason. Stay tuned. In all, it's quite good, and probably more year-round than Rita's. It almost makes me forget about Rita's -- almost. If you'd like to read more, check out the Yelp page for their other location. I assume they're a chain, but I can't find a working website for them. They'll be open pretty late, to 11 pm Monday through Thursday, midnight on Friday and Saturday, and 10 pm on Sunday. Last weekend I was hanging around my stoop and some people with gloves and plastic bags picking up trash walked by. I asked them who they were with, if maybe I missed a neighborhood cleanup, and it turns out they were from the church on the Adopt-a-Block sign on my block. They said they come down once a month or so and pick up trash. Nice to see this, and it got me thinking -- maybe some other blocks could use an Adopt-a-Block group, like Irving between 14th and 13th, for example. 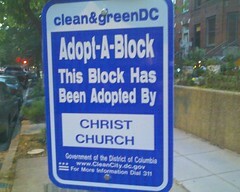 Anybody see their block's adopt-a-block folks every now and then? Representatives from the Mayor’s Office, DPR and DCHA will provide the community with updates on the recent work that has taken place at the 14th & Girard Street Park. 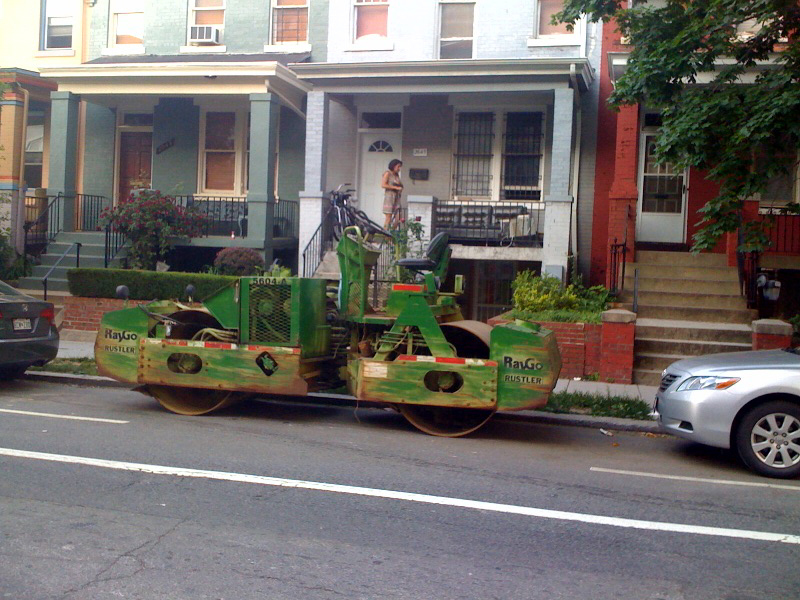 Why is there a steamroller on 15th Street? A reader sent this in: "Any idea why there is a Compactor parked on 15th Street between Euclid and Fuller? It has been there for several days." Kind of odd, and funny to see a steamroller parallel parked in a neighborhood. Anybody seen this thing, a Raygo Rustler, doing any rustling? Want a tree planted? Ask the city! Want some greenery on your block, or on another dreary block? Ask the city! Just spotted a recent posting on the Adams Morgan listserve letting people know that they can request tree planting from the city, for free. 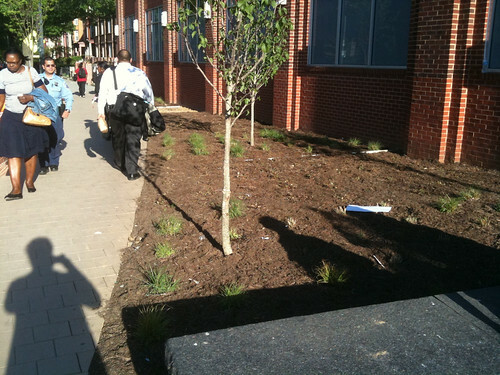 The Urban Forestry Administration will plant trees in a grass strip or an existing tree box on either your block or another block, you just have to request it by calling 311 or going to 311.dc.gov. Sounds like a pretty great service. The UFA's website has a lot more on types of trees available and on the benefits of trees: adding greenery, improving people's moods, screening harsh scenery, environmental benefits, and more. UPDATE: a commenter makes the good point that you have to water the trees and that the non-profit Casey Trees provides free watering bags. Thought this was an amusing way to start the day: a couple days ago, I saw this scooter commuter on 14th Street. 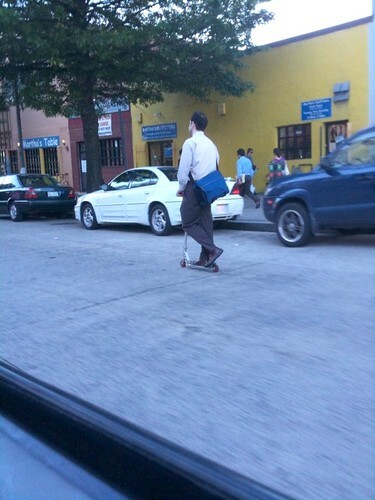 He turned out of one of the side streets onto 14th up in Columbia Heights, then zoomed down the hill. I wonder if his pushing off leg gets tired. If you wanted to get involved in local government, now's your chance. The advisory neighborhood commissioner for ANC1B06, Megan Conklin, resigned, so there's an opening. The ANC is an elected body that advises the city council and other government agencies on local issues like planning, trash, budget and so on, and they have some actual authority over liquor licenses and the like -- the ANC can basically approve or deny a place's application to the city based on their rulings. Here's more from Wikipedia. ANC1B06 is bounded by Euclid, 14th, Belmont and 15th, so if you live in the area you're eligible -- here's a map. Basically, you have to file a petition with 25 signatures of 1b06 residents to run for the office, and the election is November. However, if only one person files a petition, they are considered elected until the November election. So you could start work! The petition deadline is May 17. Candidates must visit the Board of Elections and Ethics to get their petitions and to demonstrate their residency in 1B06. The first time they advertised the vacancy, nobody responded, so this is the second shot. If nobody submits a petition, the seat will remain vacant until the election. 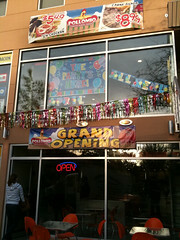 Just heard from a tipster that there's a sign in the window of the old Rita's space that Fro-Zen Yogurt is opening soon. Now I'm sad that Rita's closed and a little over the frozen yogurt trend, but I'll check it out. Plus it's nice to see an empty spot find a tenant, and frozen yogurt does seem more year-round than Rita's was. I can't find a website for the place, but I'm looking. Room 11 at 11th and Lamont has some neat events coming up: on Wednesday if you're looking for a non-Cinco de Mayo thing to go, they're hosting reps from Gotham, Stalking Horse, and Puppeteer, an Australian winery. Then on Thursday will have the owner and distiller from High West, a distillery in Park City that makes some great stuff. Please join us on Wednesday, May 5, for our very first meet-the-winemaker event when we are proud to have as our guest Bruce Clugston of Australia’s Gotham, Stalking Horse, and Puppeteer and to welcome back his daughter Kate Clugston who represents the family wines in the United States. They’ll be discussing their wines from 7:30 – 9:30 pm and while supplies last we’ll be offering 5 different wines including Gotham McLaren Vale Cabernet and the rare Gotham Old Vine Mataro; all available in half and full glasses paired with an a la carte special menu featuring dishes with indigenous Australian spices created by chef Ben Gilligan. Also join us the next day (Thursday, May 6) from 5 – 6 pm for a Happy Hour with David Perkins, Proprietor and Distiller of Park City, Utah’s, High West Distillery. More info coming soon! Assuming my translation is accurate, Cinco de Mayo is tomorrow in Columbia Heights, and some local spots are having events. Social at 14th and Meridian NW has $5 margaritas or $25 pitchers, plus $1.50 fish tacos and $3 guacamole and blood orange pico de gallo. Plus they now have sidewalk seating. I would assume newly opened Alero has deals as well, and Taqueria Distrito Federal might be a good spot to get some traditional grub, deals or not. Know of any other deals in the neighborhood? Interestingly, apparently Cinco de Mayo is not such a big deal in Mexico -- 16 de septiembre is the big one. 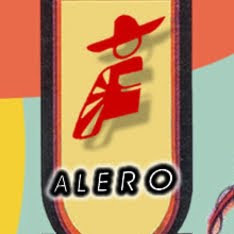 Just got word from a tipster that Alero had a soft opening last night and is now open for regular business. It's located in the old Rumbero's spot, 3345 14th Street NW. 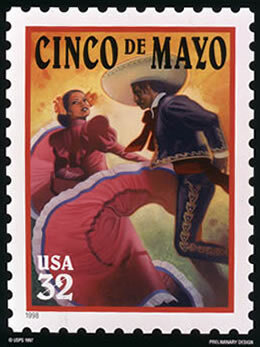 And it's almost Cinco de Mayo, so I'm sure they'll do something for it. Last year I walked past the Alero on U Street and it was packed. 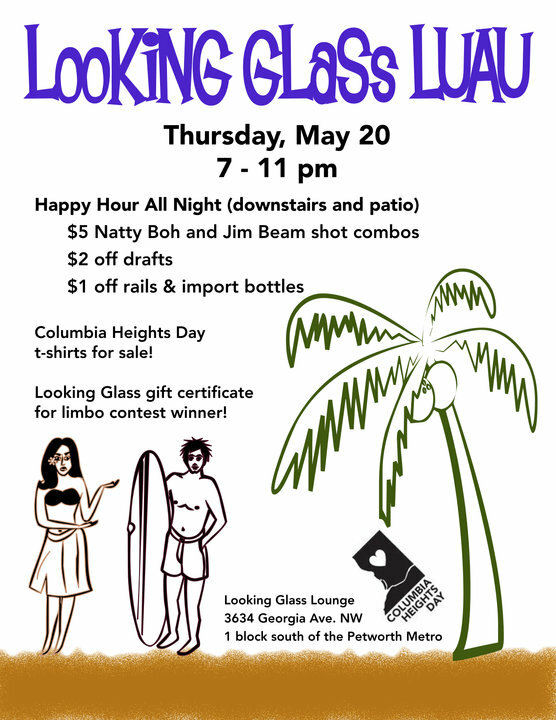 If you have any tips for the blog, send them to newcolumbiaheights(at)gmail(dot)com! Looks like the eastern part of the neighborhood is getting a historic walking trail as well -- Columbia Heights had one finished earlier this year. The Georgia Ave/Pleasant Plains trail will start at 6th and T and head up to the Georgia Ave-Petworth Metro station, about 1.5 miles total -- here's a map. On Tuesday at 6:30 there's a meeting on the trail, with representatives from Cultural Tourism DC, the Emergence Community Arts Collective and more. 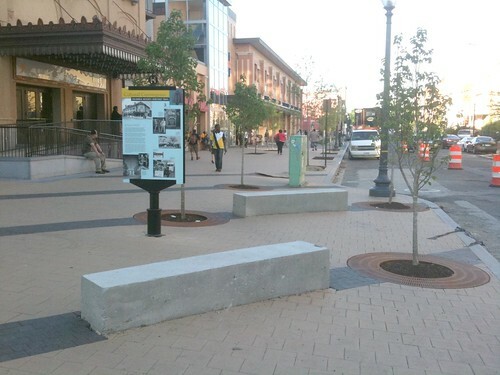 The trail is funded by the DDOT and the US Highway Administration. The meeting is at the ECAC building, 733 Euclid Street NW. The trail will include signs on the Martin Luther King Jr riots, Howard University, Griffith Stadium, the old Washington Senators baseball stadium, the area's Caribbean heritage, Abraham Lincoln, and more. Sounds pretty interesting. 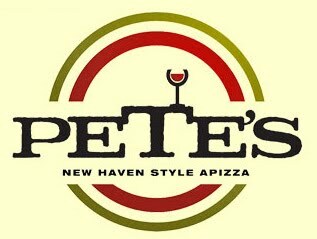 The other day I was browsing around on Pete's Apizza's website, and they have some interesting content. The first part is a three-part series showing how their pizzas are actually a good deal, which they call the "Pete's Value Proposition." I've heard people say they're expensive, but Pete's goes through and compares theirs with other locals pizza joints, and for the most part comes out on top, that you get the same amount of pizza for less money. On another page on their website, they talk about how there is a lot of parking nearby, and how to get into it -- also useful for people coming to other business from out of the area.